It seems only reasonable that I learned about the seminar in the title above through Twitter. 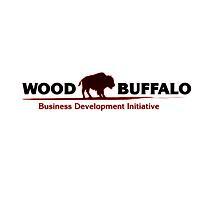 After all, the seminar hosted by Wood Buffalo Business Development Initiative was all about using social media as a marketing tool, and how to effectively incorporate it into a marketing and communications plan. So, how did this blogger who is employed by no one end up there? Well, endless curiousity, of course, and also a desire to see how what I am doing connects with others in our community - businesses, organizations, and non-profit groups. 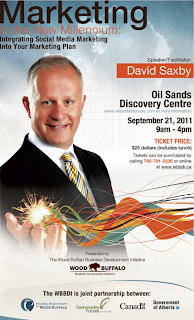 So, I found myself at the Oil Sands Discovery Centre to hear David Saxby, marketing guru, give a presentation on social media as a marketing tool. I discovered I was in excellent company, too, with representatives from most of the major businesses and groups in the city - Keyano College, local banks, realtors, non-profit groups, and entrepreneurs - attending. It was an eclectic group, but all had a common goal - how to use this brave new world of Twitter and Facebook, blogs and LinkedIn, to maximize their public exposure. David Saxby might have his roots in traditional marketing but he has clearly embraced the new landscape of social media, and knows his stuff. I was delighted with the examples of effective social media he mentioned (among them the campaign for mayor in Calgary that ended with Nenshi elected when he was very much a dark horse at the beginning, and the advertising coup that was the "Best Job in the World" contest in Queensland, Australia). While some at the seminar were familiar with these examples some were not, and I could see little lightbulbs going off as they began to realize just how effective social media can be. The afternoon was spent in a working session, and as many participants had brought laptops we were able to practice some of what we had learned. I think that many walked away with a new appreciation of the role of social media, and a better understanding of how to use it effectively and efficiently. Now, to me what is best about much of social media is that it is free. You can have a page on Facebook, a Twitter account, and a blog, and have it cost you absolutely nothing. The true beauty of this is for non-profit groups that operate under very tight budgets, but still need to reach the largest audience they can. Social media has huge potential for them, although the down side is, as always, finding the time to use it. I also wanted to say a few words about the WBBDI, which is a group that I think deserves some mention. This group was formed initially to help retail businesses, but then changed their directive to encompass all small and medium sized businesses in the RMWB, and to help them to achieve their business goals. They do this through an IADR approach, which summarized means Informing businesses of marketing strategies, Attracting qualified employees, Developing the knowledge and skills of the existing workforce, and helping businesses learn to Retain their employees. This seminar was a great example of the assistance they provide to business owners, and for a cost of $25 I think most attendees walked away with new ideas and strategies worth far more in the long run. So, people, I went to a seminar, I learned about the effectiveness of social media (okay, I'll admit, I already knew about this aspect because I've been doing it for awhile now, and because I have a keen interest in it), I had a great lunch catered by the Sawridge, I learned about the WBBDI, I met a marketing genius who embraces social media, and, best of all, I met some people in our community who are of that passionate and visionary kind I love - business owners, marketing professionals, entrepreneurs, and employees of non-profit groups. I had a chance to meet some of the people in our region who work in all these fields, and it made me realize what truly amazing people exist in this community. There are some remarkable people in Fort Mac - and last week a few of them were in the theatre at the Oil Sands Discovery Centre talking about Twitter. It's a brave new world indeed. I wrote recently about the RMWB's plan to revitalize and develop the city centre, and my excitement over that plan. One of the things that thrilled me most, though, was not the plan itself but the desire to engage the community in developing it. I recall when I was a child in Saskatoon, and the neighbourhood we lived in was deemed in need of a community centre. City hall granted the funds, the community centre was built as they specified, and it was a done deal. Community input? Zero. Community suggestions? Not welcome. 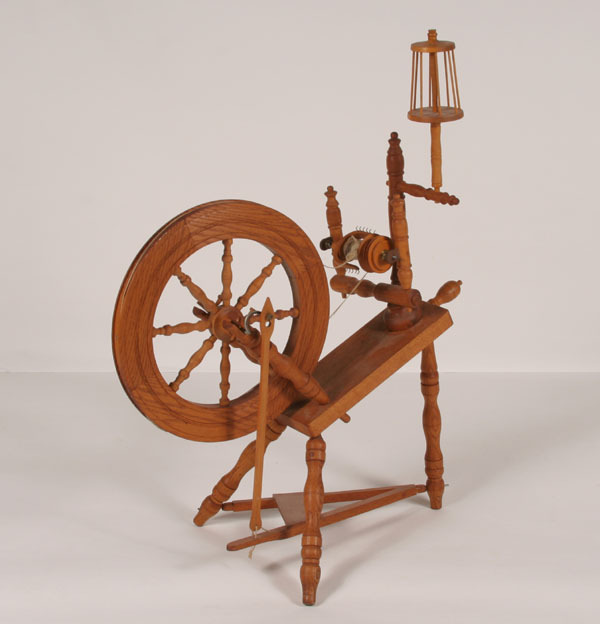 The community got what was offered and built, and, frankly, that was the end of the discussion. Well, people, how times have changed - and for the better. This week I attended the community engagement meeting for another development on the horizon - MacDonald Island Park. Now, I have lived here since before MI went through it's last development phase, and knew it when it was a much smaller facility. I watched the last development with delight (despite some of the agonizing woes it went through, which, to be honest, are true of any construction project). I was delighted to see Tim Reid, MI Chief Operating Officer, outline the latest concepts for the next phase - and to see how much community input has gone into it. The process began with the MI board of directors requesting a plan for development of the island space, but with one requirement - the input of community members was essential. The plan needed to co-ordinate with the RMWB and their City Centre Action Plan (CCAP) and Municipal Development Plan (MDP - play along, people, I live in a world of acronyms these days). Most of all, though, this was not a plan that would linger on a shelf gathering dust - it was to deliver results. It wasn't to be a "we could do this" or "in the distant future we might do this" - it was to be a "this is our future, and we are going to do this now" plan. The objectives of the plan are to develop a world-class facility in the midst of a liveable city centre. It is to be a community-led project, with residents being asked and encouraged to help to determine what the facility should encompass. It is to be a facility to meet the needs of today, and tomorrow, which thrills me as I believe we have been prone to short-sighted thinking in this area, and not looking far enough into the future. We have played "catch-up" for a very long time, been behind the game - and it's time to be pro-active. So, MI engaged the community. 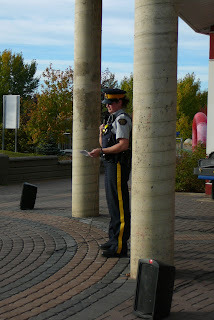 They did community interviews and public meetings. They worked with the people from CCAP and MDP. They presented their ideas and asked for suggestions from interest groups and non-profit organizations. 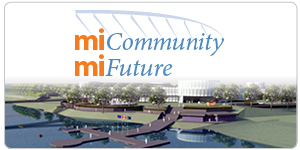 They are now in the process of engaging the community even further through the use of the MI Community MI Future website, where you can view the plans and, more importantly, leave comments. There are also interactive screens set up at MI where you can do the same thing but while being surrounded by the current MI facility. The result thus far? Astonishing - and wonderful, in my opinion. A place that incorporates walking trails and outdoor performance areas (with the space for 20,000 spectators), stadiums for baseball and softball, an art gallery, and, most importantly, a "shared space" facility designed to host some of our local non-profit groups, allowing them a central hub for their operations. And there is so much more, people, like restaurants, splash parks and climbing walls, and, eventually, perhaps, a rowing club facility on our own little marina. The link to the city centre? A pedestrian bridge across the Snye that will link the revitalized downtown core to our world-class arts, culture, sports, and recreation facility. The goal is to create a vibrant community in our city core, a place of home and belonging, a place where we can work and play together, and a place with economic resilience. The architectural designs are beautiful, built on a concept of waves (waves are always moving into the future, ceaseless and powerful) and circles (circles are synonymous with community and inclusion, and have signified gathering places since humans formed circles around fires in caves). There is a great deal of glass on the enclosed areas of the building, which I think is spectacular as it allows you to see our beautiful natural surroundings, and brings a bit of that outdoors inside for all to enjoy. Is there a cost? Of course there is, people. The figure quoted, as the design is presented currently, is $55 million. That seems like an incredible amount, but here are some other figures : 250,000, which is our projected population by 2030. 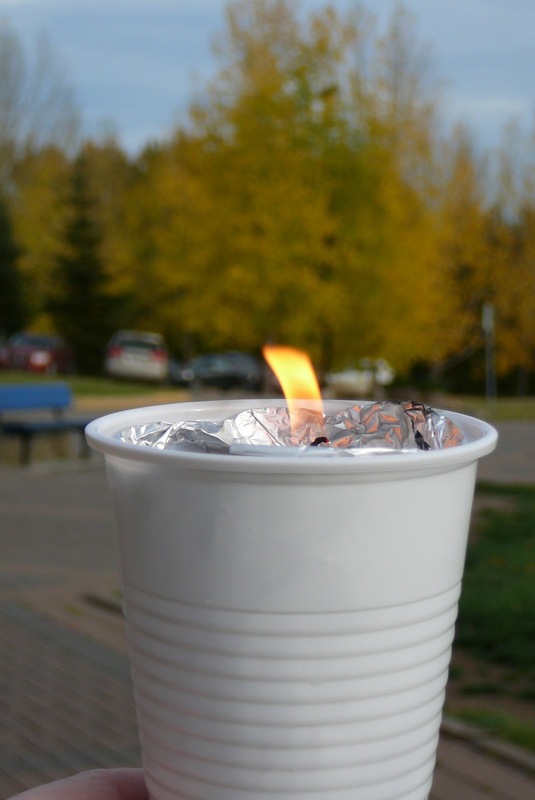 85%, which is the percentage of those that will live in the city of Fort McMurray itself. 22%, which is the percentage that will live and/or work in the downtown core. When you look at those population numbers that $55 million starts to seem pretty reasonable in order to have a facility that can truly address the needs of that population. People, we have been cautious for a very long time in this city. We have taken baby steps, and we have always been behind the game, building only after a demand had been created and thus dealing with a lack of facilities and infrastructure. We now have a bold mayor and city council who are willing and able to address the future that is staring us in the eyes, and we have a community that is experiencing a resurgence and revitalization of it's own. I grew up in Saskatoon, a city that has become known as "the Paris of the Prairies". Why shouldn't we (and why couldn't we?) become known as the "New York of the North"? We can embrace our future, prepare for it, and anticipate it - a far better tactic than waiting for it to sneak up on us and then be blindsided by it. So, you know my opinion - but the process isn't over. MacDonald Island Park is still seeking community input and engagement. Visit this website, look at the plans, and have your say. Go to MI and check it out on the big screens, and when you see the comments box put down what you think. I left my comments there today. I said this: "A bold visionary plan that excites, and makes me hopeful for our status as a world-class city. Be bold, be unafraid, be leaders, and help the RMWB take us into the future!" 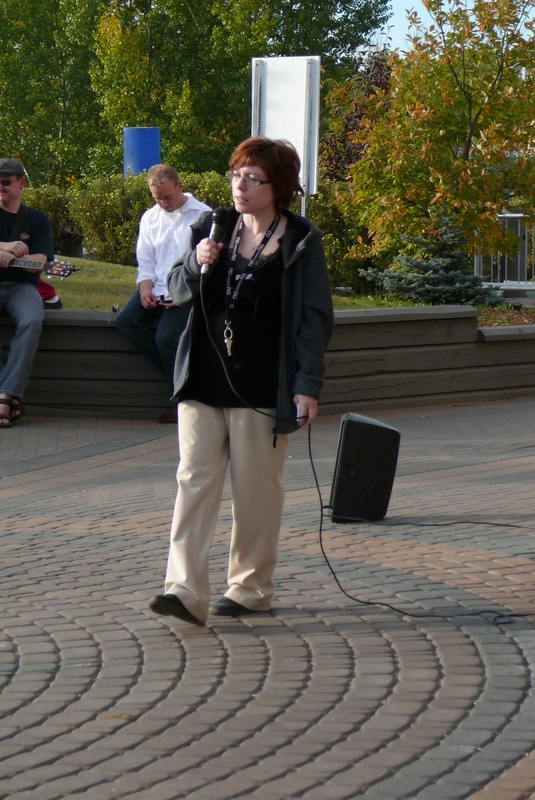 What do you have to say, Fort Mac? Be sure to be heard - and be part of the future, both of MI, and of the RMWB. A city isn't buildings and bridges - it is the people in it, and the community they build. Let's build a great one, shall we? When you have kids you often find yourself surrounded in a swirl of excitement. In my house (with two teen-ish girls) this can occur over a YouTube video, a new song, or, as happened recently, the grand opening of the new Junior High that they happen to attend. 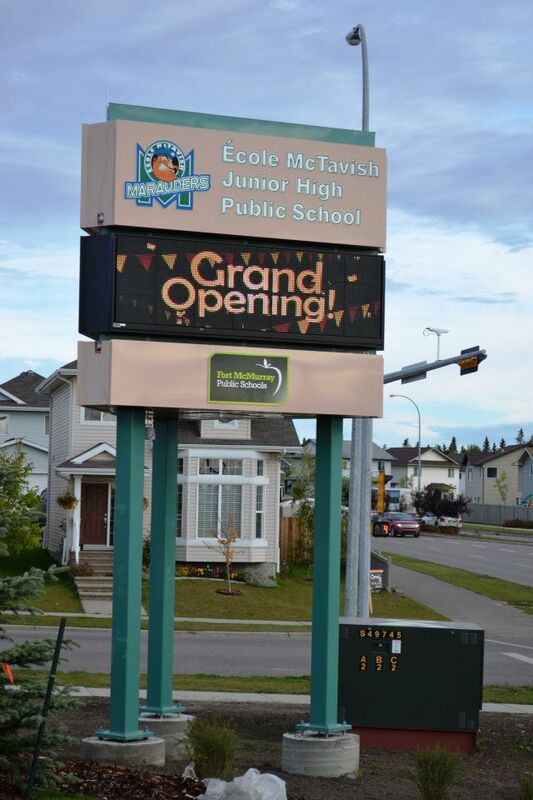 On Friday of last week Ecole McTavish Junior High Public School celebrated it's grand opening, and what a celebration it was, people. I arrived at the school and found it a hubbub of activity, which schools usually are - but on Friday there was a special feeling in the air. I walked in the front door and found myself being greeted by students wearing Marauders jerseys and waiting to shake my hand to welcome me to the school. Two young ladies escorted me to the gym for the ceremony and on the way we chatted about their excitement to be a part of the new school. I was delighted to see that the enthusiasm for the school was clearly not limited to my own children but seemed to be a pretty common sentiment in the student populace. 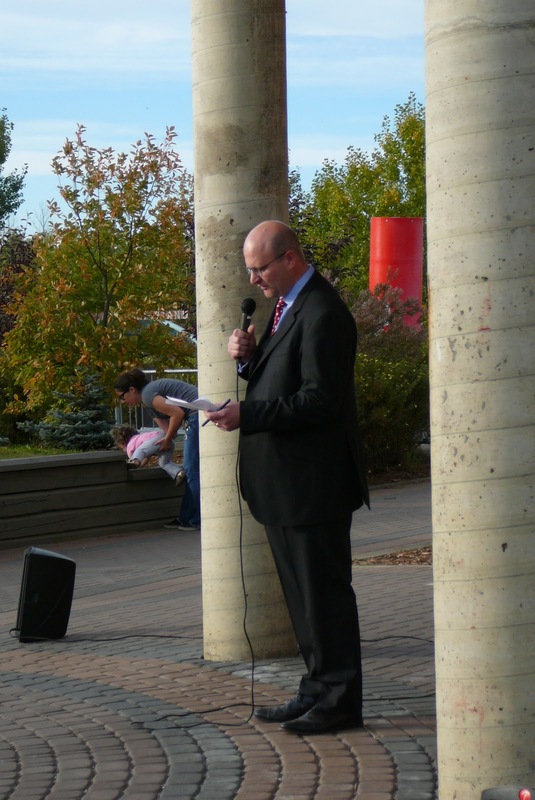 There were a lot of local dignitaries present for the event, like city councillors and the mayor. 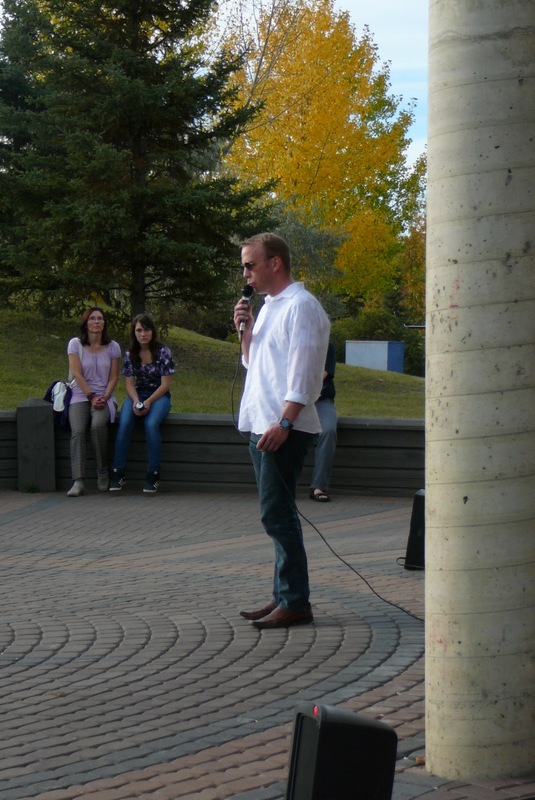 There were folks from the school board, our local MLA, the minister of education for the province, and other MLAs. In my mind, though, the most important attendees were also the loudest - the 700-plus students who were cheering, doing the wave, and high-fiving everyone in sight. Their enthusiasm was infectious, and I saw a lot of smiling and high-fiving adults, too. There were the traditional speeches, of course, and my favourites were the ones that talked about the leaders of the future being right in that very gym - because, of course, it's true. 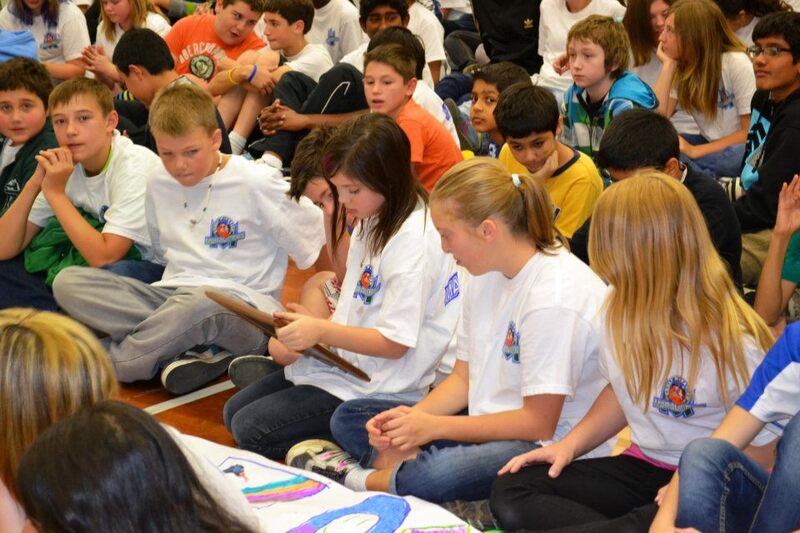 No one can predict what any of these kids will end up doing, but we could have a future premier in that room. Or prime minister. Or olympic athlete. Or researcher that will cure cancer. 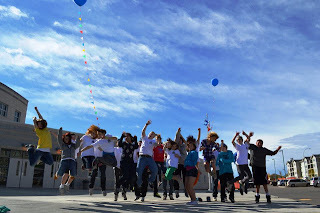 The point is that the possibilities are endless, and these kids could go on to be anyone and do anything - and that's the whole point of schools, to help students to achieve those goals (even goals that aren't quite as lofty as the ones I just noted but ones that are just as significant regardless). 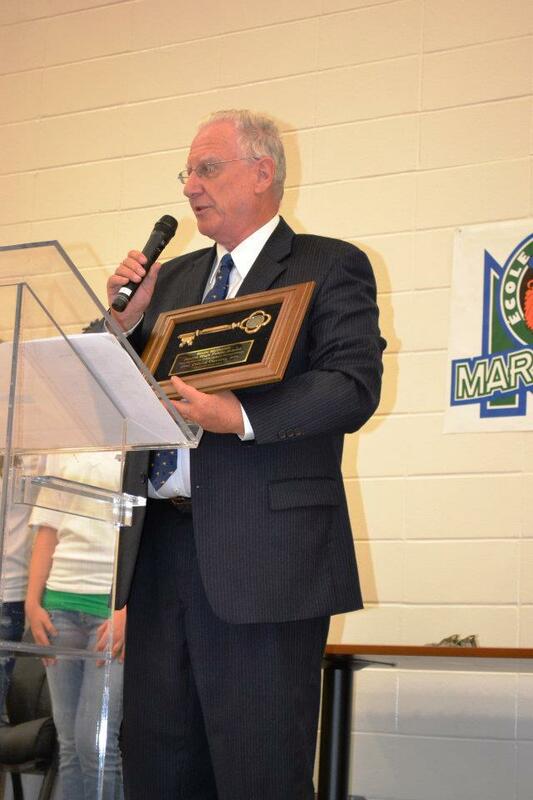 Schools are, as district superintendent Dennis Parsons said, "a place where dreams become tomorrow's reality". There is great truth in that simple statement, people. 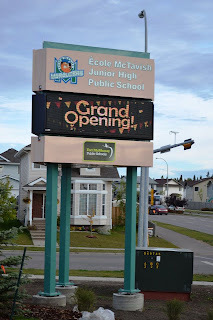 I was astonished to learn that the last time a public school opened in Fort Mac was 25 years ago. The community has changed so much in those two and a half decades, and grown at such an amazing pace. In some ways it makes the opening of this school just that much more significant, as it seems a hopeful sign of all the other new schools that are sure to follow. This school, and all the others like it, will welcome all those students, children born here and who have moved here, and it will shepherd them through all those vulnerable, exciting, and impressionable years of youth. 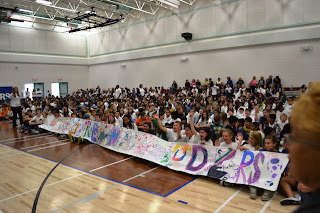 The speeches were great, with MLA Guy Boutilier getting all the kids to do the wave, and with Mayor Blake once again giving one of her terrific speeches (she manages somehow to always keep it relevant, and to relate to her audience no matter if they are children or adults - it's a true gift, people). My favourite moment, though? Not the ribbon cutting, or the speeches. Not the mascot or the wave. It was when Scott Barr was presented with the ceremonial key to the school, and he immediately handed it into the audience of kids, telling them that he wanted them each to touch the key because this school belonged to them. 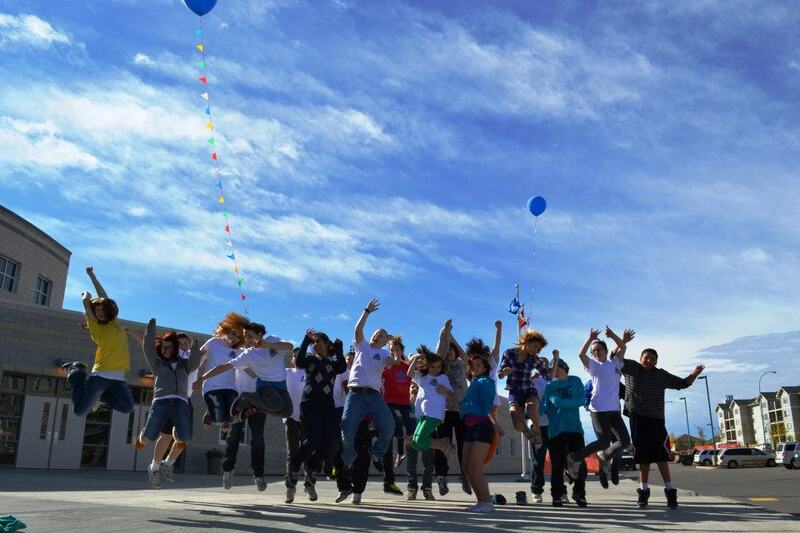 It is that pride of ownership, that sense of community, and that feeling of inclusion that has infused this school since before it was even built. Scott Barr, who I have written about previously, is leading this school into becoming not just a tremendous educational facility but also a community of students and staff who share a passionate commitment to their school, and to each other. It's an incredible thing to witness. It was standing room only at the opening ceremony, as it should be. After the guests and attendees have drifted away, though, what remains is a school that I am quite certain is going to turn out those future leaders. What remains is a community within our larger community, and a place which these students will one day look back on fondly and with pride, saying "I was there for the grand opening of that school. It was the best school. Ever." And you know what? I think they will probably be quite right, people, as a school isn't really the building but the people in it - students, staff, parents - and this school has all the makings of the best school - ever. Congratulations, Ecole McTavish students and staff, on your grand opening - and on your very bright future. I can't wait to see you shine. It's an interesting place, this city. I've often heard comments about how the arts and culture community is somehow lacking here, and yet I find this to be an absurd statement, and so very untrue. We have a vibrant arts and culture scene, and all one needs to do is to embrace it. Recently I had the pleasure of receiving an advance copy of the latest issue of NorthWord, a magazine born and published right here in Fort McMurray, and through it I discovered yet another facet of that arts scene. NorthWord specifically publishes works of writers from northern Canada. The magazine is only released twice yearly, but that release is a much-anticipated event in our little, but burgeoning, literary community. I sat down on a lovely autumn afternoon to read my copy, a day when my living room happened to be drenched in that warm fall sunshine we have been enjoying, and it seemed fateful since the theme of the issue I was reading happens to be "Light". I read a stunning poem called "Solace", by a poet named Suzanne McGladdery, and it was a piece that spoke to me on many levels as I have experienced the feelings it evoked. There was the twist of fate (and a ladder) in the short story "Vanity Lights" by Melodie Campbell, and an equally astonishing twist of events in the short story "My Husband's Wife", by Julia Madeleine. In fact, I read every single word this magazine contained, my favourite mug of coffee in my hand, and I revelled in the talent those words revealed. You see, people, writing is not easy, and I know this first hand. One would think it is effortless and that it simply flows, and some days it does. Some days, though, it fights back and you struggle to tame those words, to find some way to force them onto your paper (or your laptop screen, as in my case). So, to read northern writers who can make those words dance and sing as if puppets to their intent and imagination is amazing. To see them do so in a publication based in our own community makes it even more incredible. NorthWord seeks submissions from all northern writers, and if you have ever considered submitting your works to a magazine I suggest this would be a wonderful place to do so. It may seem a slim publication, small and humble in relation to those enormous book-mark requiring magazines that line the bookstore shelves, and yet I think we all know that sometimes the best things can be found in the smallest packages. When you open an issue of NorthWord you can feel the love and commitment of those who are involved in producing this magazine have for it, and for the written word. This is, as one of them said to me, "their baby". This is their gift to the world, and their gift to our community. For $9.50 you can own a copy of NorthWord, share in their vision, and accept that gift. 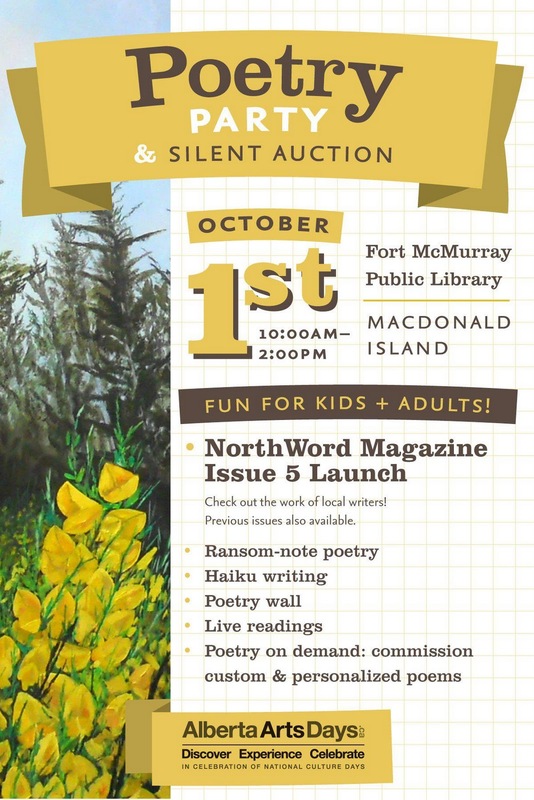 NorthWord also happens to be hosting a Poetry Party and Silent Auction on Saturday, October 1st, from 10 am - 2 pm at the Fort McMurray Public Library. There will be copies of the magazine available, as well as poetry-related activities and games. This is an ideal opportunity to check out the literary scene in the community (and yes, people, it does exist) and to support a wonderful little magazine that allows some northern talent to shine. The best part is that there is also time to submit your work for the next issue of NorthWord. Submissions will be accepted until October 15th, and can be sent to The Editors. The theme of the next issue is "Sin", and I cannot wait to see northern writers explore that topic as it's quite an enticing one. Look, people, these sorts of publications run very close to the bone. The individuals who publish them put a great deal of blood, sweat, tears, and love into them, and the pay-off in terms of money is virtually zero. The true pay-off comes from the pride of giving writers in the north a place to share their works, and in providing others with the pleasure of reading them. This is the true beauty of a publication like NorthWord, but without public support these efforts can falter and even, sadly, disappear. So, do me a favour. 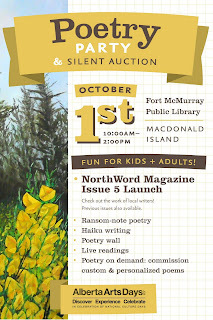 Go buy a copy of NorthWord, and/or come on out to the Poetry Party on Saturday. Show those who publish this magazine that they are appreciated, and show those writers who have their works in it that those works matter and that they are important. In the end, people, we all want what we do to matter to someone - so be that someone, would you, Fort Mac? See ya on October 1st. This post is a bit of a departure for me, people. I don't typically write about the oil sands or the environment, but not because they don't matter to me. It's more because I leave the writing about those things to other people who know them better, who understand them more, and who can speak to them through their direct experience. 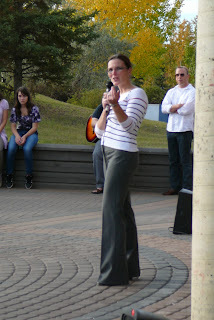 Yesterday, though, I was invited to attend a very special event, and as Suncor was gracious enough extend an invitation to this blogger (and decidedly non-traditional media type) I decided it was truly worth telling the story. In fact, this story is worthy on many levels, since it is a positive and optimistic story about reclamation. One year ago Suncor made history when they unveiled Wapisiw Lookout, or, as it was formerly known, Pond One. Pond One is the first oil sands tailings pond to be reclaimed - ever. Now, this may not seem significant, but it's absolutely huge when one considers how long some of these ponds have been around - over 40 years. That puts this into some perspective, I think. 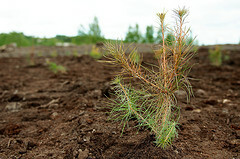 Yesterday, though, as Suncor celebrated the first anniversary of Wapisiw Lookout they also celebrated another milestone - the planting of the 5 millionth tree. 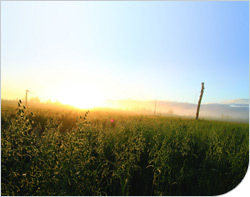 Suncor planted their 3 millionth tree in 2004 - and that was from when they began in 1974. So, in those three decades 3 million trees were planted - and since 2004, in 7 years, they have planted 2 million trees. This shows the acceleration of the reclamation process, and I think a true commitment on their part to mitigating their environmental impact. The bus out to Wapisiw Lookout is an interesting ride. You travel through the boreal forest lining highway 63, you go through the security gate, and then you see the industrial side of the oil sands process. But then, suddenly, you find yourselves driving through a quiet little spot of grasses and trees, a place with a wetland and birds wheeling overhead. You are at Wapisiw Lookout, and the industrial side seems to recede as it is replaced with this bit of nature in it's midst. There is a lookout point built in the centre of the old tailings pond, and from it you can see the vast expanse of trees and barley. It was close to this spot that local dignitaries Melissa Blake and Guy Boutilier joined Ivy Wigmore and Suncor executives to plant the 5 millionth tree. Elders from local First Nations groups were in attendance, as were members of the media and some Suncor staff. 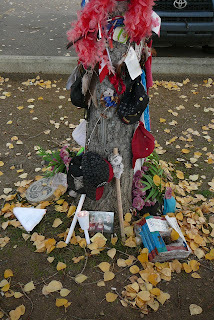 It was a quiet event, the silence broken only by the sound of shovels as trees were lowered into the ground. After the tree was planted I headed over to the lookout to see what was going on. I'd been told that several black bears have taken up residence here, but I imagine the arrival of the bus had likely scared them off. Probably the same was true of the deer that can be found here, and who moved in shortly after the reclamation of the tailings pond was complete. The life I noticed seemed to be swarms of blackflies, some bird droppings, and, finally, a bird of prey, wheeling over the field as it hunted. Now, some might have been bothered by the flies and the droppings, but to me it seemed such a hopeful sign - because it meant that life had returned to this pond, life in all it's forms. Tailings ponds are dead places, where nothing lives or grows, and yet here at Wapisiw Lookout there are trees and rat root (a plant much valued by First Nations peoples), birds and bears, toads and flies. This is a place where life has begun to breathe again, where the natural world has begun to creep back in, coaxed and encouraged by those Suncor employees who share a passionate commitment to make it happen. On the bus ride out to site Mark Little, Suncor Oil Sands Executive VP, spoke of Suncor's commitment to balancing the economic, social, and environmental side of oil sands development. This comment struck me as this is the kind of balance we need in all places, from our industries to our communities. This is the kind of balance we seek even as individuals, and Suncor is seeking this kind of balance on a company-wide scale, which truly must be applauded. So, yesterday I saw a tree being planted, and I saw a site that has been turned from one of those infamous tailings ponds into a beautiful little spot in the middle of an industrial site. I saw birds flying over that spot, and I saw signs of life everywhere I looked. I saw a passion, commitment, and desire to preserve the environment while balancing that with our world's need for oil. I saw a company celebrate another milestone, and achieve another goal. I saw hope, people, and I saw a reason for our entire community to celebrate a positive achievement attained by one of our local employers. 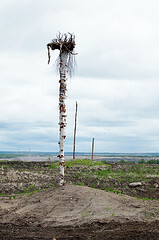 So, while I may not write often about the oil sands, and while my commitment has been (and will remain to be) writing about our community, I saw how this landmark of a 5 millionth tree had implications for all of us in Fort Mac, and how it was yet another way to tell our story to the world. In that one little tree, that 5 millionth seedling, lies the hope and commitment and passion of an entire company, and, to be honest, of our entire community. 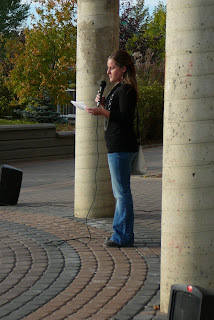 I thank Suncor for inviting me to be a witness to it, and for allowing me to share in this event. I look forward to the planting of the 10 millionth tree, and to the reclamation of all the other tailings ponds that will one day follow Pond One and become alive again. In 1976, in Belgium, 2000 women from 40 different countries held an evening event that was unlike any other. These women walked through the streets of Brussels holding candles and they held a quiet vigil. Why? 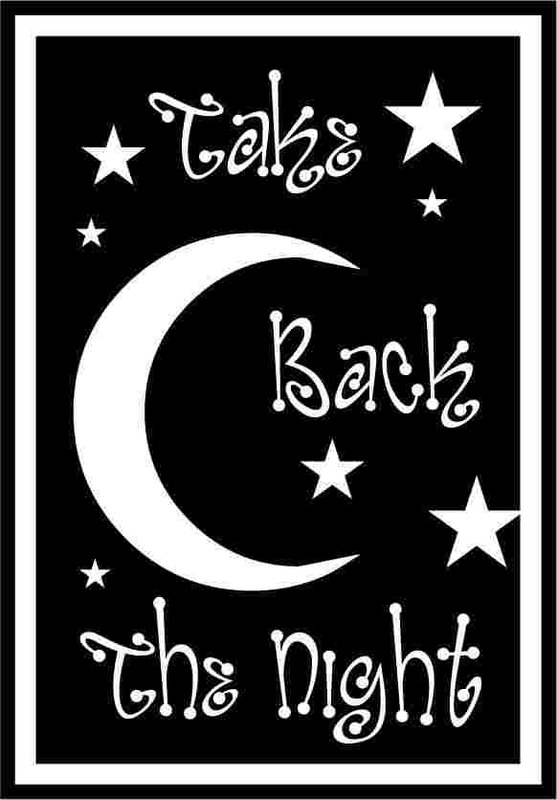 To remember victims of sexual violence, and to "take back the night", to reclaim the night as a safe place for women around the world. Over the decades since then Take Back the Night has grown as movement, and has changed a bit, too, becoming a way to commemorate all victims of violence, whether it be domestic, sexual, or random. It has become a way for communities to memorialize those who have been lost to violence, to remember those who are still suffering from it, and to remind ourselves of the commitment and duty we have to stop violence, and to break the silence that surrounds it. 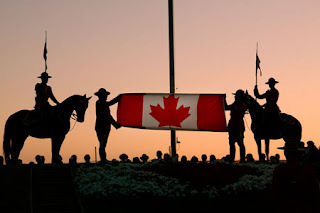 Last night was a glorious evening in Fort Mac, people. I headed down to Borealis Park and was amazed at the splendour of the fall leaves. The sun shone warmly and the entire park took on a glow in the late afternoon light, and it seemed there could be no better time, and no better place, to hold this year's "Take Back the Night". I was pleased to see that Mayor Melissa Blake was in attendance, as was local lawyer and city councillor Don Scott. Both spoke to the impact violence has in our community. Mayor Blake spoke of the need to build empathy, and how that empathy leads to a refusal to accept violence as part of our lives. Don Scott spoke of his own experience with clients who come to him and who may have experienced violence but who are often afraid to share that story, who are afraid to break the silence, and how he tries to help them to see that in breaking the silence there is power, and healing. Members from our local victim services unit spoke of elder abuse, and of violence that occurs in our home, our schools, and our workplaces. 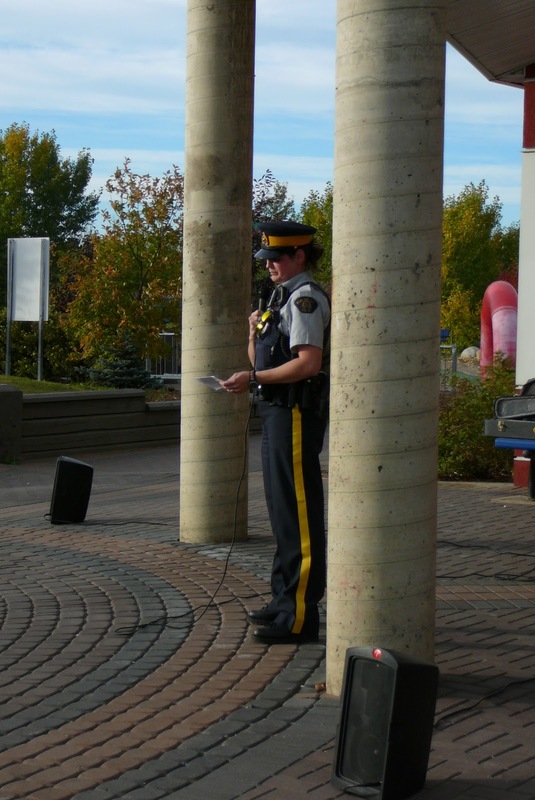 A local RCMP constable spoke of her experience as a professional with violence, and about how often victims will downplay what they have experienced. MC Jon Tupper spoke of witnessing a shooting, and about how violence has an impact on even those who simply witness it - because, in the end, we are all victims of such violence, whether we are hit by that bullet or not. After the speeches there was the candlelight portion of the vigil, and this was perhaps the moment that touched me most. Seeing all these people there - a diverse group, all ages, both genders, and all walks of life - holding these candles told me one thing - they had all been impacted by violence in their lives. Perhaps they had been the direct victim. Perhaps they loved someone who had been. Perhaps they had witnessed a violent act that had changed their lives, or perhaps they had simply heard about an act of violence that tormented them. Regardless they had chosen to be in Borealis Park last night, and they had chosen to take back the night in their own way and fashion. After the candlelight vigil ended there was a short walk, but I admit I did not stay for that part. Instead I snuck away, just down the hill a bit and into the parking lot of Borealis. I went with my candle to a place I find myself often in Fort Mac - the memorial to two twin brothers murdered early this summer. It may seem strange since I did not know these boy and I do not know their family, and yet I often go to this spot and park my car and sit there for a bit. I think about our community, I think about what this kind of death and violence does to it, and how it just rips at your heart while also ripping the fabric of our city. I sat quietly with my candle and thought about two young men who were the victims of the kind of violence that frightens us all, and who I would never have the chance to know because their lives were extinguished by another hand holding a knife. I placed my candle there by their photo, and when I finally snuffed the candle out I was overcome by a wave of sadness for two boys who shouldn't have died, and for family and friends who shouldn't be living in the sort of hell that this kind of grief brings. I thought about all those in our community who live with violence every day - those who are being subjected to abuse in whatever form - and about how a small piece of their soul must die every day even though they are physically alive. I thought about our commitment to each other in this community, and this world, and I thought about how we can act to end violence. I thought about how we can watch out for each other, how we can step in when we suspect violence is occurring, and how we too can break the silence by engaging in the simple intentional act of asking "are you being hurt?". We can help those who are victims to seek help, and to break their own silence. We can ALL break the silence, Fort Mac, we can take back the night - and we can seek to end violence in all forms in our community to make us a stronger and better place to live. in our community touched by violence. Last Friday I heard that there was an open house at the municipality's new Planning and Development offices downtown on Franklin. These offices have been dubbed "Future Forward Place", and that name alone was enough to capture my attention. What really lured me in, though, was that the open house was about the future plans for our city centre - an area of Fort McMurray that desperately requires attention, people. In recent years I've spent a lot of time in other Canadian cities, and what I find saddest are the downtown cores that are neglected and, as a result, dying. Businesses fold and are never replaced, leaving empty storefronts. As the core empties other elements move in - drugs, often, and crime, as those things prosper in areas with little foot or vehicle traffic. A vibrant city centre is possible, and some cities, like Saskatoon, have fought hard to keep their downtown active and lively. Without thought and planning, though, the retail community moves into outlying areas of a city, often leaving only offices downtown. This leads to a loss of restaurants, a place where the only activity is office workers from 9-5, and a very iffy after-5 atmosphere. This also means for residents in those city centres there is little to do and they need to seek entertainment and retail options in those outlying areas. The problem just grows and grows unchecked, until the city core is left empty and almost beyond hope for redemption. I was delighted to see that the RMWB is taking a very pro-active approach and is looking at ways to both revitalize and develop our city centre. One of the city planners, Jeff, actually walked me through the entire display, which was laid out in a concise and clear manner. There are plans to develop our riverfront, which is clearly a treasure we need to protect, in a way that will encourage both business and community initiatives while still protecting it's natural beauty and allure. There are plans to make it easier for developers to get approval to develop certain things in certain areas while still maintaining a high standard for that development. To me, though, best of all is the involvement of the community in these plans. I truly admire the way the RMWB is engaging the community in all these plans and ideas. They are holding open houses and information sessions, and they are seeking community input. The recognition is that residents are the ones who live in this community and as such should have significant input on these developments. All of this ties into the Municipal Development Plan, an initiative I have been following for some time. I have been both intrigued and delighted by the input from the community, and by the response from the RMWB. This type of collaborative effort is the ideal way to grow our community, and to see it develop in the way we wish it to. Now, it takes some effort, people. If you want to be involved you might need to visit some websites, or attend some of these open houses. I've been to a couple now, and what I have found are municipal employees who are not only willing to listen to your ideas but are eager to do so. They seem to be thrilled to explain the process, and to exchange thoughts and ideas. This is an opportunity to be involved in the changes that are coming to our city - and changes, they are a-comin' people. According to all predictions we are looking at rapid population growth, and we need to be ready. We can just allow the municipality to change without our voices being heard - or we can be a part of the process, and we can help to guide those changes in the way we want to see them occur. If you've ever wanted to be part of something big - to be part of something that will affect the future - then this is it, people. Get involved. Get engaged. Get into the action and let your thoughts and opinions be heard. The RMWB is listening - so tell them what you think needs to be said, and help them to make this place the home you want it to be. Do it, Fort Mac - because this is, quite truly, our town. I am always intrigued when I hear people complaining about how they have "nothing" to do in Fort Mac. Intrigued, and annoyed, too, as there is no shortage of things to do here if one just starts to take a look around. This weekend I went to MacDonald Island Park to check out the "Get Up and Go Wood Buffalo" event, and once again was astounded by exactly how much there is going on in this community. Get Up and Go Wood Buffalo is like a trade show for community clubs, service groups, and volunteer opportunities. I think it's such a terrific idea to have an event to showcase all these aspects of our community in one place so people can wander around and see what interests them or their family. There are sporting clubs present, with information about what they do and how to get involved. There are community facilities with booths, like the local YMCA and MacDonald Island. Most interesting to me, though, are the groups that both provide services and are also primarily volunteer-based, like Fort McMurray Victim Services (this is a service that intrigues me personally, and one I hope to write more about). I suppose what struck me the most about Get Up and Go Wood Buffalo is that after spending ten minutes there I knew that there is absolutely no reason for anyone in this city to be bored. Whether it's getting involved in a sport, a club, or volunteering there is something here for everyone. Yes, it takes some initiative. Yes, you might have to leave your house. Yes, you might have to go looking for it. But it's there, people, it's all there. You just need to get up - and go! There is no shortage of fundraising galas in this city. For most of my years here, pre-occupied with my primary job of raising my daughter, I have not attended many of these, but this year I decided to take in as many as humanly possible. Why? Both because of this blog, and because of a desire to more fully integrate into this community, to see the spirit and the courage and the possibilities. Last night I attended the Canadian Cancer Society's Harvest of Hope at the Sawridge Inn - and people, all I can truly say is "oh, what a night!". 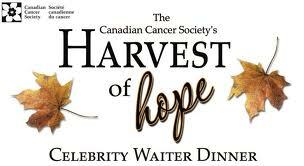 The Harvest of Hope is based on the idea of having celebrity waiters work the event - local figures of note, like politicians, realtors, etc - and have these waiters compete to raise money for the Cancer Society. When I heard about the dinner this year I was intrigued, but there were two problems : I didn't have anyone to go with, as my husband was away at a conference, and tickets were sold out. I have a philosophy though, which is basically that in life you can regret not trying or you can try anyway and live without regrets, so I put out the call on Twitter. I tweeted "Any tickets for Harvest of Hope?" and waited for the reply. 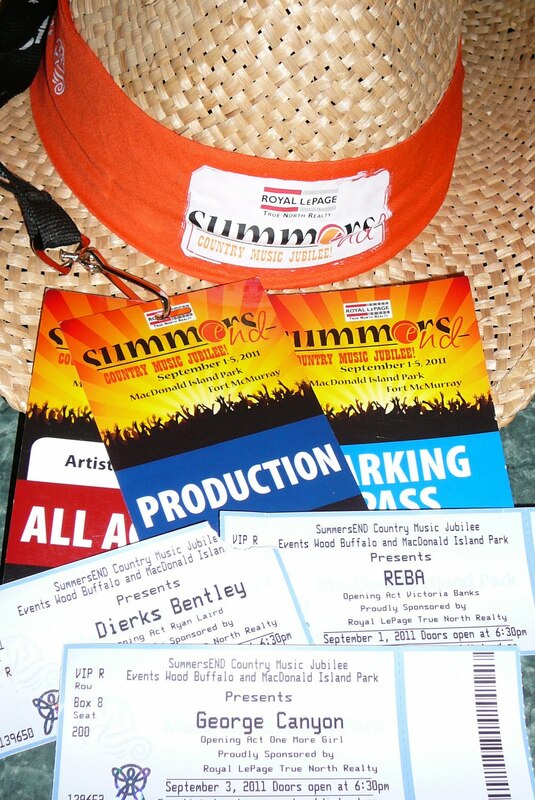 It came quickly, and from none other than our local mayor, Melissa Blake, who tweeted that she had heard that Ruth Francoeur from the HUB had tickets, and suggested I contact her. I sent Ruth a message, and told her I needed one ticket - because I would go solo. As it turned out I didn't go alone, people. I took my dad with me last night, and he didn't even need a ticket. You see, my dad died of lung cancer just over 5 years ago, and while he is in my thoughts most days last night this was especially true, as every time I felt awkward or out of place I thought of him there with me - and he would have loved every minute of it, too. I'd like to say the dinner is "controlled chaos", but that would suggest some element of control that just isn't there. I knew things would be interesting when shortly after I arrived I discovered I would need to pay Ruth (the server at our table) for my cutlery (this is done through the use of "funny money", which is used as the currency for the event although real cash is welcome, too). The other people at my table were all from the HUB, and I don't know if I've ever met a nicer, more welcoming group. It turned out I knew one of the women (and her young adult daughter) from one of my daughter's sports activities, so I had someone to chat with right away (and the young adult daughter and I quickly discovered we had common interests in men in uniform, writing, and generally having a good time). Even if I hadn't known them, though, I think it would have been quite fine as the folks from the HUB seem to have this ability to make you feel like you belong (which is quite likely why the HUB is one of the most popular spots in this town for young parents and children alike). I'd been told to bring cash, and a lot of it, so I did. I purchased my funny money, and sat back to be entertained. To say I was "not disappointed" is the understatement of the year, as it was clear from the moment the celebrity waiters paraded in and were forced to Zumba until someone paid to stop the music that things were going to get crazy. I learned very quickly that these waiters are ruthless in their attempts to outdo each other to become "top waiter", as a waiter from a different table came around trying to sell us napkins (Ruth chased him off pretty promptly, and I'd suggest you don't mess with Ruth from the HUB, folks). Things got nuttier and nuttier, too. I paid celebrity waiter (and councillor) Russell Thomas $20 for being the first follower of this blog, and a huge encouragement to me in this adventure. I paid $20 to waiter/councillor Don Scott for being the person who convinces me to attend all these events (and often inviting me to attend, too). I paid $40 to see Don and fellow waiter/councillor Phil Meagher waltz, and it just might have been the best $40 I've ever spent in Fort Mac (I won't even describe the inappropriate touching that went on there but I will say I'm not sure I will ever look at these two quite the same way during council meetings). I watched as all these local people of note "let loose" and just showed what good sports they all are. As for our poor waiter Ruth - well, by the end of the evening she was wearing clown shoes, a red clown nose, a clown wig, and had a fake baby in a baby carrier strapped to her back. She told me she had feathers in her armpits and silly string in her underwear (as she quipped "a sure sign of a good night!"). She served our food, got us drinks from the bar, barked like a dog, and did all the other ridiculous things we asked of her with good humour and great enthusiasm. I suppose for me the crowning moment was when a celebrity waiter announced what she would do if the room raised $7000. She would shave her head. I was, quite frankly, thunderstruck. I'm not really tremendously vain but I'm not sure there IS enough money to convince me to shave my head. I watched with fascination as the donations poured in, and suddenly, there it was - $7000 had been raised, a chair was brought onto the dance floor, and out came a hairstylist and the clippers. Right there, in the Sawridge ballroom, the bravest woman in this city, Fiona Deeney-Paradis, shaved her head to raise money for cancer research and support. I was front and centre, taking it all in, and all I can say is that while Fiona was beautiful before she looked even more amazing after. She had this glow about her after that, as she and her shaved head walked around the room as she attended to her table. I tracked her down, handed her $50, and told her that she is the bravest woman in this city. I suspect she would argue this and say that it is instead those who battle cancer who are bravest, and she is probably right, but last night, for that moment on the dance floor, she was the bravest person in my universe, people. I hope she woke up this morning feeling glorious, because just thinking about her makes me believe I too can do anything (thanks, Fiona!). The food was great, of course, and local radio guys Ben McCully and Jerry Neville did a terrific job as Masters of Ceremonies. Ross Jacobs acted as the auctioneer for the live auction and managed to make people cough up lots of cash for some pretty spectacular items (sailing trips, and helicopter tours, for example). The night ended with dancing and music, although I didn't stay for much of that. I was, quite honestly, a bit worn out from a busy day and the all the frantic activity of the evening (I can't even imagine how tired the poor celebrity waiters, who had been jumping through hoops all night, must have felt). I'd seen celebrity waiters sing, dance, and get crazy. I'd seen them wear everything from devil wings to chef hats to a barrister's wig. I'd seen people get silly for a cause, and raise a lot of cash. How much cash? I went on to Twitter this morning, and an unofficial report I saw said it was $273,000. I'm not sure about you, but I'm staggered by that amount. 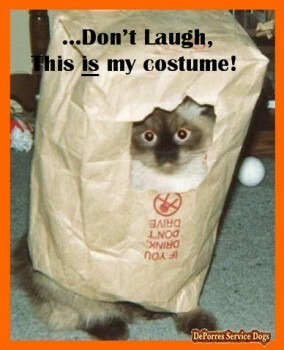 But it seems about right, too, as I know I gave freely and happily last night. I bought tickets for draws for an iPad 2, Oilers game tickets, and things I don't even remember (didn't win a single thing, and didn't care, either). I came home with a pin from a local RCMP officer/waiter (I'd paid $10 for it, and it has special meaning as the RCMP have become one of my interests in the course of writing this blog), a pass to a zumba class ($20, and I warned the nice zumba lady that I am totally uncoordinated - I didn't tell her that having me in her class will likely be much like having a bowling ball in a room full of dominoes, but she will find out soon enough), enough money for taxi fare, and *maybe* a cup of coffee. I also came home with memories, feelings of joy, and a sense of the strength of our community. So, to my thanks. 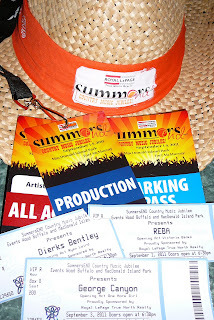 Thank you to Ruth Francoeur, for selling me that ticket, and making me feel so welcome last night. Thanks to the folks from the HUB, who took in this local stray and made her feel like a part of their group. Thanks to all the celebrity waiters who put aside any reservations, got crazy, and raised an equally crazy and astonishing amount of money. Thanks to all those who organized the event, the Sawridge for the food and staffing, and everyone else who made it happen. Thanks to all those who attended and who I saw give so freely and so generously, their hearts (and wallets) wide open. Finally, thanks to my dad, who was my date last night in spirit even if he couldn't be there in person. I could sense his presence beside me all night, and with him I saw our community laugh and sing and dance and celebrate...and hope. Because in the end, people, it's all about hope, and we harvested a whole lot of hope last night. Well, people, I'm going to admit it right up front - I know very little about the oil sands industry. I've never worked in the industry, and while I know many who do I can't claim any direct and personal knowledge. This week, however, curiousity got the best of me and I found myself at MacDonald Island to check out the exhibitors at the 2011 Oil Sands Trade Show. I knew this was a big event when I arrived at Mac Island and found myself being directed to park on the grass. Way, way far away on the grass, in fact, in a far corner where I found one of the few parking spots that were free. This should have been my first clue that this is an enormous trade show, but I can be a little slow in that regard and thus it wasn't until I stepped into the building that I realized exactly how big the trade show is. I headed to the registration desk and told them I'm a local writer who was interested in finding a specific person at the show (which I was, an artist named Lucas Seaward, about whom I plan to write more soon). They very helpfully handed me a visitor pass, and while I came to see Lucas I ended up staying to explore the trade show a bit. What I discovered was a world of safety equipment, valve fittings, work boots, and stainless steel applications. I found exhibits from hotels and local oil sands companies. I found myself standing bewildered in front of a few booths where very kind folks tried to explain about things like cranes and valves (people, those things are NOT my area of expertise). I suspect they clued into the fact that I'm not "in the industry" pretty quickly but they still were kind enough to answer my questions (no doubt shaking their heads and laughing when I walked away). I marvelled at the big cranes set up in the Mac Island parking lot, and I loved the highway-pavement themed carpet runners in the exhibit areas. And those exhibit areas are enormous. I was surprised they didn't have exhibits stuffed into the women's locker room and beside the treadmills at the gym as they seemed to be everywhere else, spilling out into the halls and jostling for space in the field houses. I was thrilled to see all this activity, and to note that many people seemed to be coming here from other cities (and countries) to participate. They were here staying in our hotels, visiting our restaurants, and hopefully getting a glimpse of our community pride and spirit. Look, people, I will likely never fully understand valve fittings. I'm hopeful in that I seem to have a better understanding of how cranes work, and I even find the safety equipment a bit fascinating. For me, though, the Oil Sands Trade Show is very much a chance to just explore an area about which I know little but am very curious. For those in the industry it is a chance to network and learn and further expand their knowledge, and their business. 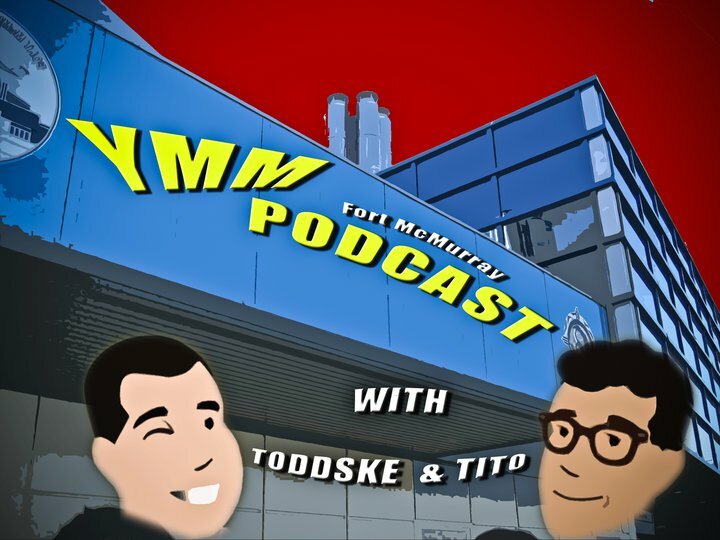 And for those who come to Fort McMurray from other places to attend the show it is a chance to see our community, and perhaps go home with positive stories about their time here. For that reason alone I think it is a very important event in our community, and I do hope all attendees have a terrific time in this city. 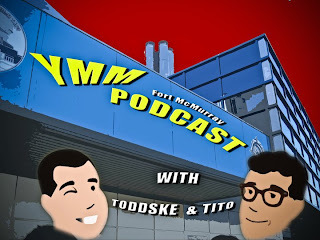 I hope they make all those valuable connections and sell some of those valves and educate people on that safety equipment - and I hope they leave Fort Mac thinking that this is not only a great place for a trade show, but a great place to be, too.